Arsenal play catch up…as Sunderland lead the way!!! 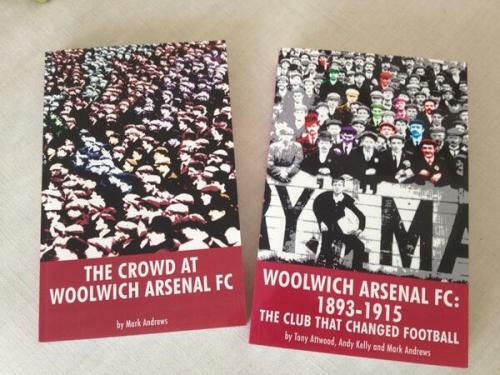 We rarely veer from the historical but for this blog we will regarding this weekend’s big win. Now obviously from the title this is not about the football, as it was evident from Saturday’s win that, on the pitch, very little is right about the Wearsiders who showed why they are now favourites for the drop. It is not about Brexit either, for while the Sunderland landslide “Leave” result at half past midnight showed the way the country was leaning we are a non-political concern. 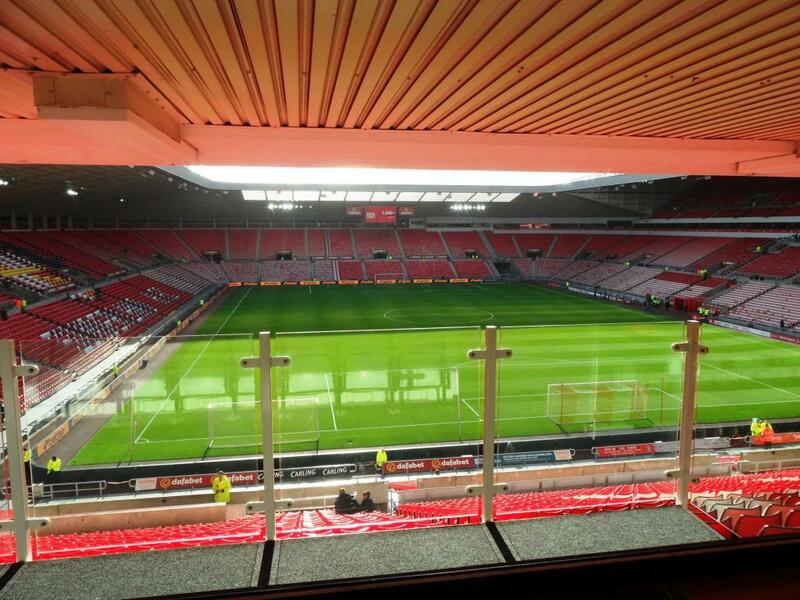 The Stadium of Light Sensory Room for those on the autistic spectrum. The sensory room was the brainchild of a couple – Kate and Peter Shippey – who have three children on the autistic spectrum, the eldest of which loves football but was not able to enjoy it in a crowd owing to the noise, mass of people in one space and overall atmosphere. The Shippeys contacted Sunderland a few seasons ago and, after discussions with Chris Waters, the club’s Supporter Liaison Officer, the practicalities of turnimg the germ of the idea into reality were put into place. The Sensory room is located in The Black Cats bar, directly underneath the area set aside for opposition fans at the north end of the stadium. The view of the pitch is excellent from the sensory room. View from the sensory room taken by Mark before the match. Chris had arranged that before the game on Saturday, my wife a SEN specialist, and myself were given a tour of the Black Cat area and the room by our genial host Rob Mason. Rob is the Sunderland club historian and also the equivalent of Andy Exley in that he edits and writes much of their match day programme and official club magazine. The room is a lot smaller than I imagined, being approximately 10 by 12 feet, and able to accommodate 3 children and their parents, but on reflection if it was any larger it would defeat the purpose of the scheme. If expansion is required in the future the club will not expand the room but add a similar module either next to the existing room or in an appropriate location nearby. It is designed to bring serenity to those with sensory difficulties, and while not age specific I imagine it would be more in use by children. The idea being that the fan can watch and lend their support but without the overbearing noise that would otherwise spoil their enjoyment, and most likely lead to an early exit from the ground. Though there is enough of the atmosphere, as it is not totally soundproofed to ensure it does not appear they are just sitting at home watching the TV. Planned in tandem with local autistic groups there is a step allowing optional standing, a number of comfortable seats, and ear defenders in case even the muted noise gets too much. A communication board with cards is provided for those with limited vocabulary and there is also a TV so the game can be watched via this media. 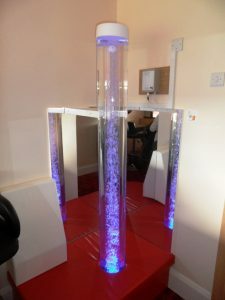 There is a bubble tube with a padded mat, which is a colour changing column a bit like a lava lamp, in case they need to get away from the match for a bit of calm. Currently, while Sunderland were the first place to have this ground breaking idea, Notts County and Chesterfield have followed, or are in the process of setting this up at their ground. As it is so small a room it leaves a very minor footprint on the total space required, and as such is something that could and should be replicated at as many stadiums as possible. Arsenal do fantastic work in the community, and this would be another feather in their cap if they were to take up this scheme. We urge Arsenal to take this up in the Emirates, especially as grants and other incentives are being awarded by companies and charities. See the recent Shippey Campaign and BT assistance announcement. This is an outstanding example of an idea being put into practice, and we take our hats off to the Shippeys and to Sunderland Football Club.